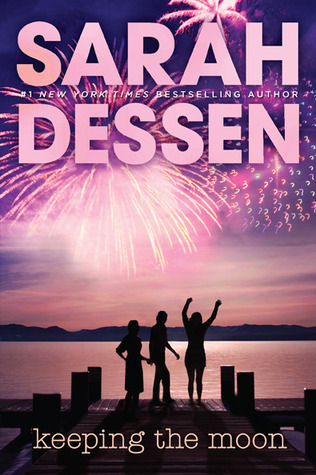 Keeping the Moon is the third book I've read for my Sarah Dessen Readathon! I have to admit, this readathon is seriously the best thing ever, as the more books I read of Sarah's, the more I look forward to the next book, and that makes me even more excited for Once and For All, Sarah's newest book which is due to release in June! Some of Sarah's books I've read before, and some I haven't. Keeping the Moon is one that I've already read, but I can't really remember much about it. Bits and pieces, yes, but not much more. I was super excited to read it again to refresh my book-filled brain, and once I started reading the book, all the memories of reading it before came flooding back. I LOVE WHEN THAT HAPPENS!! I really enjoyed both the characters and the storyline for the book. Colie, the main character, was very relatable in so many ways. I totally get her, and I loved watching her come out of her shell, with the help of her aunt Mira, and her new friends, Morgan and Isabel. I also really loved Norman, AND Cat Norman as well. LOL! This book sounds like a really good read. It's so much fun rereading books!